In a truly mesmerizing occurrence, sometimes bright, beautiful, colored lights can be observed in the evening sky. 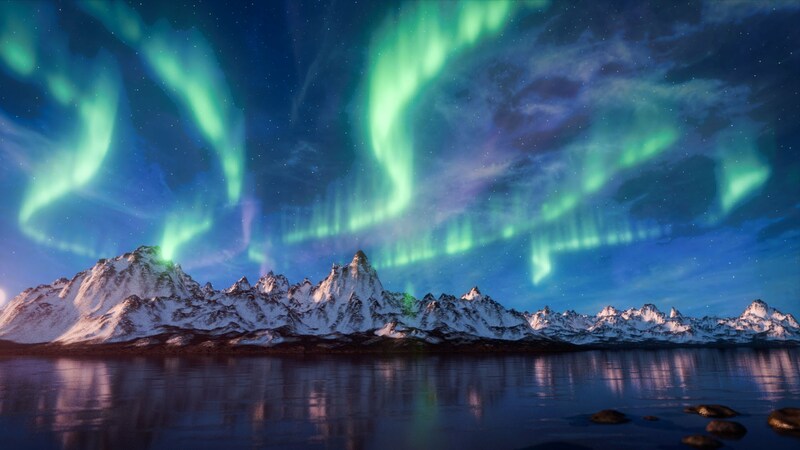 Widely known as the Northern lights or sometimes the Aurora borealis for the North and Aurora Australis for the South, the shimmering magical lights are more prevalent in the areas of the magnetic pole, which regions are mainly found in both the northern and southern hemispheres. The transient display appears in numerous random colors, with shades of green and pink being the most rampant. The impact of our sun on this planet is remarkable. It comes as no surprise therefore that it would produce such an effect on the atmosphere. When gaseous particles found in the earth’s atmosphere collide with charged particles released from the sun’s atmosphere, the effect results in the emission of variations of color caused by the collision of the gas particles. Oxygen molecules found close to the earth’s atmosphere produce the green color, while oxygen in higher altitude areas with heights of up to 300 miles produces a reddish aurora from the collision. On the other hand, during the collision, charged nitrogen particles produce the mesmerizing pink light of the aurora. To understand the concept of the lights further, one can liken the gaseous collisions in the atmosphere to the neon gas emissions and collisions used to light regular neon lights. Ideally, to get the best glimpse of the lights, one would need to live or travel to areas in the northern or southern hemisphere, where the closer one gets to the poles, the better the view one has. The northern lights result when charged particles streaming from the sun collide with molecules high up in Earth's atmosphere, exciting these molecules and causing them to glow. The different colors of the northern lights come from different molecules: Oxygen emits yellow, green and red light, while nitrogen is responsible for blue and purplish-red hues.Earth's magnetic field lines channel these solar particles toward the planet's north and south magnetic poles, which explains why auroras -the aurora borealis and its southern counterpart, the aurora - australis are high-latitude phenomena. Additionally, the unavailability of sunlight, which is usually characteristic of the winter season, provides the perfect setting to observe the aurora of the northern or southern lights. Although in the past, people have come up with anecdotes to explain the mystery of the lights, the explanation for their beauty is based firmly on scientific research. So the best places to see auroras are near the magnetic poles. These include areas of northern Greenland, the Scandinavian coast, Siberia and Alaska in the north, and Antarctica in the south. But when planning your trip remember: places above the arctic circle have round-the-clock sunlight during about April to September! This can make aurora viewing difficult. And the aurora australis might be observed by many penguins from May to September, but even scientists do not go out much during the Antarctic winter! If you're planning an aurora-viewing trip, make sure not to schedule it in the middle of summer. You need darkness to see the northern lights, and places in the auroral zone have precious little of it during the summer months. You also want clear skies. Winter and springtime are generally less cloudy than autumn in and around the northern auroral zone, so a trip between December and April makes sense. Ideally, time your trip to coincide with the new moon, and make sure to get away from city lights when it's time to look up, he added.Dress warmly, plan to watch the sky between 10 p.m. and 2 a.m. local time, although an active period can occur anytime during the dark hours. You can get an idea of how active the northern lights are likely to be in your area by keeping tabs on a short-term aurora forecast.